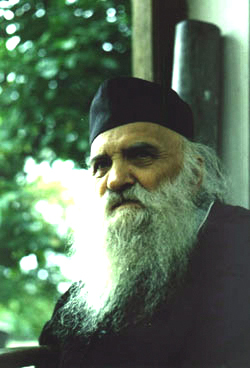 One of the most important confessor fathers in Orthodoxy, Father Arsenie Papacioc (August 15, 1914 – July 19, 2011), reposed in the Lord today, July 19, 2011, aged 97. He was the spiritual father at St. Mary’s Monastery in Techirghiol (Romania). For the past 35 years, it was there that believers would find Archimandrite Arsenie Papacioc. Fr. Arsenie had been ill for some time and died a little before noon, in his monastery cell. Theologians say that Father Arsenie was a man a peace and a pastor of joy. Fr. Arsenie Papacioc has gone to heaven, to meet with Jesus Christ, about Whom he would talk to children during the civic education classes that he taught during the communist times. Fr. Arsenie upset the regime for having shared Christian faith to the little ones. Followed by the Security, Fr. Arsenie hid among monks for a while. Yet he was eventually arrested and taken to Suceava and held up for investigations for 90 days, during which time he was beaten and tortured. After heavy years of imprisonment in several communist prisons and forced labour camps, he was released and allowed to serve at St. Mary’s («Sfânta Maria») Monastery in Techirghiol, which he did, from 1976 to the present. By Fr. Ilarion Argatu Those who have lived away from the Holy Church and have not confessed and taken the Eucharist for years on end will see that once they decide to come back to it, they have trouble standing in the church, because of the evil spirits who have now come to live inside them. Thus, during the Holy Liturgy, these people don’t feel well, they feel sick, they are weak to the point of fainting, some of them tremble, others fall to the ground and flap around, some bark, meow, bellow, or moo. The bad spirits that dwell in man do so.